Let me first say that there is a Holga that natively takes 35mm film. However, that’s no fun! When you use a Holga 120 and load it with 35mm film you get to shoot images across the sprockets. That creates a fun look with the image going the full height of the frame. Plus it means you only need to have one camera to do both things. So this is what you need to do this. You need your Holga 120, some black electrical tape, some foam, scissors, rubber bands, the spare spool you’d always need anyway, and a roll of 35mm film. To begin with, wind the rubber bands around the top and bottom of the right-hand spool. This is to help guide the film as it gets rolled onto that spool. On the left side, cut the foam into rectangles that will snugly hold the 35mm roll in place. That doesn’t have to turn or move at all. Only the film itself has to slide out. Tape the foam down. I’ve had images “altered” because the foam got pulled out of position and ended up sitting in front of the film area. Here’s a beautiful image of a fountain in Cozumel where a foamie creature slid into view. I added on the eyes :). Once you’re sure you’ve taped the foam into place, pull the 35mm film across to the right spool just like you normally would, and get it to catch in the slot in the spool. Wind it all as normal. Now seal it up and you’re all set! Make sure you PERMANENTLY SEAL the back window for this. 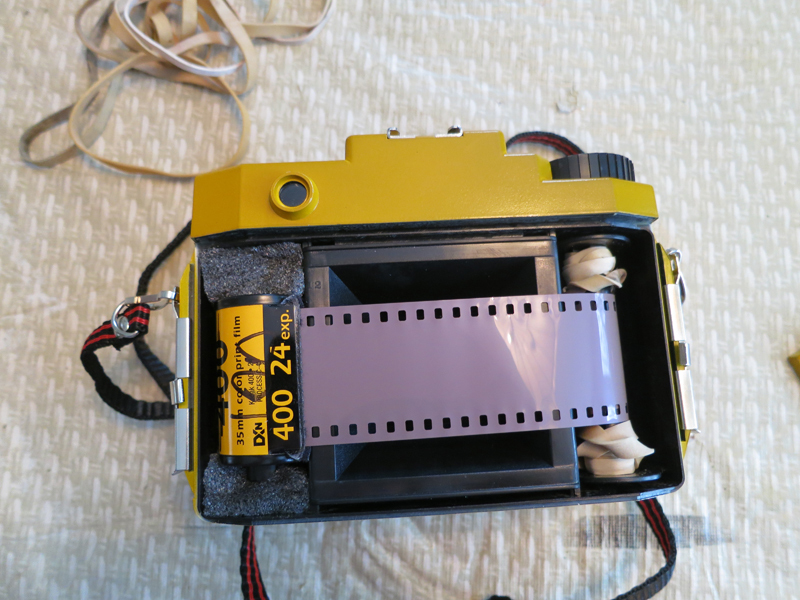 There is no paper backing on this film so it is never safe to open that back window while there is 35mm film in the camera. Instead you need to “count the clicks” of turning to know when you’ve turned enough. Start with 34 to get to the first spot. Then count 24 after that for each subsequent spot. I always mark my Holga so I remember it has 35mm film in it, so I don’t lift that back flap. Even if you never lift that flap, though, if you don’t seal it with incredibly dark tape, this is what can happen.